In the glory days of Nikkatsu Action, Asaoka Ruriko was easily the most attractive, popular starlet around. Ravishingly gorgeous and a much more than capable actress, she was in extremely high demand. It seemed as if Nikkatsu released a new picture starring Ruriko every other week--and nearly all were resoundingly successful at the box office. She was a certified pop culture phenomenon. Between the years of 1955 and 1967 she appeared in 121 films! Her lovely face frequently (if not constantly) adorned the cover of every popular magazine in Japan (often tripling the blessed publication's usual sales!)! She was a closely watched fashion-plate, a trend setter, and a benchmark for the "Modern" Japanese woman of the late 50's and 60's. In those days, every film company in Japan, including her own parent company, repeatedly launched campaigns across the country, searching for someone to become, "the next Asaoka Ruriko". She became synonymous with "glamorous movie star". So, imagine my severe surprise, shock, and massive frustration when, doing the research for this profile, I discovered nobody knows anything about her! Now, don't misunderstand me, I found plenty of information from diverse sources; however, little of it added up to an acceptable level of coherence or credence. For every detail of her life--or professional history, for that matter--I found at least four different sets of supposed facts! Unable to determine the truth about this enigmatic screen siren, I am relegated to foisting upon you, dear readers, my own random impressions of Asaoka Ruriko. 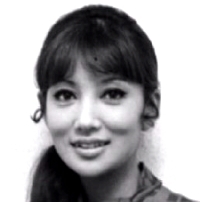 Ruriko was the ideal Nikkatsu suke. Her stunning looks were supported by a tremendously versatile, emotive, acting ability. She excelled in any role she was assigned, be it comedic, romantic, dramatic, or action-oriented. Many a hard-nosed film critic of the day--unswayed by her beauty--would often have to state, "The best thing about this picture is the performance of Miss Asaoka Ruriko!". Her adaptability made her the quintessential Queen for Nikkatsu's wide and wild array of individualistic Action Kings. No matter with whom she was paired, she seemed perfect. She provided excellent counterpoint, as well as support, for the intense performances of Akagi Keiichiro, with whom she appeared often. When cast with "Mr. Dynamite", Kobayashi Akira, she could, appropriately and alternately, be the charming damsel in distress to be rescued, or the girl-next-door inspiration behind Akira's heroic deeds. Matched with Shishido Jo, she could become a potent fireball of tough-gal determination and boundless comedic energy. Her outstanding performance, alongside "Ace no Jo", in Nakahira Ko's broad action farce, "Abunai Koto Nara Zeni ni Naru" ("Danger Means Money"), ranks as one of the all-time best in Nikkatsu Aciton history! 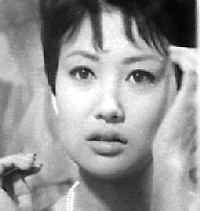 In the 1962 production, "Nikui Anchikusho" ("That Despicable Guy"), by Kurahara Koreyoshi, she co-starred with the mighty Ishihara Yujiro---many current cult film fans (in Japan) consider Yujiro and Ruriko (as seen in this film) to be the epitome of the swinging sixties couple. 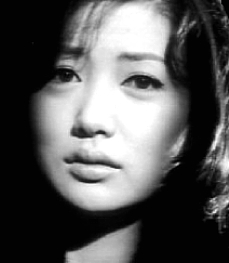 Then, there is her aloof, enigmatic performance as the mysterious beauty, with whom Watari Tetsuya becomes obsessed, in Masuda Toshio's classic, "Kurenai no Nagareboshi" ("Crimson Comet", a.k.a., "Velvet Hustler"); a truly great performance that might be closer to her true self than you might think (especially given the nature of the sketchy background information I have unearthed while trying to write this piece)! 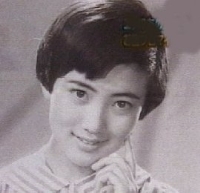 Ruriko remained a popular figure well into the 1970's, appearing in a variety of films for a variety of studios, and occasionally tackling the medium of television. She continued to be featured on magazine covers and in fashion layouts; but, with greatly reduced frequency. Scandals, whether true or rumored; reports of her "bad attitude" and "condescending behaviour", whether real or imagined, led to a decline in Ruriko's popularity by the end of the decade. Since the mid-to-late 80's she has been making fewer films, turning her acting attentions to the stage, with some degree of success. Last year, amid mounting rumors of anorexia, Asaoka Ruriko made scandalous (and some say forever damaging) headlines, when she divorced, by mutual consent, her husband, the widely-loved actor Ishizaka Koji (star of "Mito Komon", the longest running program in Japanese TV history). Though divorce is not uncommon in modern Japan, it is still infrequent enough that this high-profile example caused quite a stir. While trying to compile information for this text, some of my sources proclaimed that due to this "scandal" it would be difficult to find any information regarding Asaoka Ruriko. The former national favorite has, it seems, become something of an irritation. But, for me, Asaoka Ruriko will always be a peerless beauty and an unforgetable screen presence. Profile (?) by Chris Casey for Yaju no Yabai Gumi.2001. Special thanks to Nohara Hitoshi for some solid information! If you have ANY information regarding Asaoka Ruriko I would LOVE to hear from you! Please feel free to contact me. Thanks!